In January 1975, the Department of Health (DoH) and the Philippine Cancer Society (PCS) launched the first ever National Cancer Consciousness Week. The week-long campaign held every third week of January was instituted as a means to educate Filipinos on the dangers of cancer and raise awareness on the treatment and prevention of the disease. While many believe that developing cancer is merely a case of tough luck, the PCS states that at least one third of all cancers can be prevented. According to the society, there are two ways to lower one’s risk of contracting cancer. The first is to engage in cancer preventive mechanisms such as maintaining a healthy diet or exercising regularly. The second is to avoid the use of cancer promoting agents. Specifically, this piece will focus on cigarettes; one of the most dangerous cancer promoting agents in the world. According to the 2015 Philippine Cancer Facts and Estimates written by the PCS, cigarette smoke is the most pervasive cancer-causing substance in the country. Because of its carcinogenic nature, cigarette smoke has been cited as an attributable cause of cancers of the lung, mouth, larynx, pharynx, esophagus, pancreas, and bladder, among others. Alongside the health burden, cancer imposes a significant economic burden on those who contract the disease. Aside from significant health care costs, cancer also leads to productivity losses due to not being able to report to work, and at its worst, premature death. 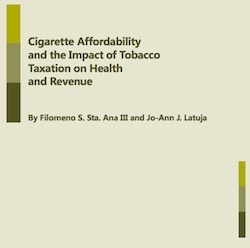 In 2017, a study by Fajutrao and Dans estimated the total cost incurred by Filipinos from these three factors resulting from tobacco-related diseases. The results from the study are alarming, to say the least. For lung cancer alone, a massive economic loss of ?8.2 billion was estimated. This does not even include the economic burden resulting from all the other cancers attributable to cigarette smoke. If it was not apparent before, it is now clear that tobacco use brings about major health and economic consequences. The government is taking seriously the debilitating health risks brought about by cigarette smoking. President Rodrigo Duterte has certified Senate Bill 1599 authored by Senator Manny Pacquiao as an urgent measure. To put it simply, the President certifying the bill as urgent affords legislators the leeway to approve the measure within a significantly shorter time period, as a means to fast-track the legislative process. Senator Pacquiao’s bill proposes to increase the tax on cigarettes to ?60 per pack, which is significantly higher than the ?35 per pack currently implemented. The proposed increase will be a big win for the Filipino people, if realized. Calculations show that implementing the tax increase will prevent at least one million Filipinos from starting to smoke, and protect more people from the hazards of smoking such as cancer. Furthermore, the tax increase will generate a significant amount of additional revenue that will help the country achieve its health care goals. In the 2013 GAA, the Department of Health (DoH) was allocated ?70 million to improve the quality of treatment for non-communicable diseases (NCDs) such as cancer. Thanks to the 2012 Sin Tax Law, the budget for NCD treatment has since been augmented to ?2 billion as stated in the 2017 GAA. This fund is sure to increase further should a high rate be implemented. We also mention the fact that the Universal Health Care Act is very close to being signed into law, and it will require a sustainable source of funding. The onus is now on the Senate Committee on Ways and Means chaired by Senator Sonny Angara to act on the certification of the President by leading the passage of a high tobacco tax in the Senate. As of this writing, Senator Angara has scheduled a second hearing on tobacco tax on Jan. 29, leaving only four session days for the measure to be passed in the Senate. Since entering the Senate, Senator Angara has branded himself as a champion for cancer patients in the Senate. Angara himself is a co-sponsor of the National Integrated Cancer Control Act, which seeks to make treatment for cancer patients more affordable. Due credit must be given to the senator for supporting the aforementioned act. We do hope he will also support a substantial tobacco tax increase, given that it is a popular bill that will be a preventive measure against cancer. As the Seventeenth Congress winds down to its final two weeks before the campaign period, Senator Angara’s actions (or lack thereof) will address a series of looming uncertainties. First, his actions will decide whether one million or more Filipinos will find themselves spared from the dangers of cigarette use, or increasingly susceptible to diseases such as cancer. Second, the progress of the tobacco tax bill in the Committee on Ways and Means in the Senate will be critical in determining whether or not the Universal Health Care Act will have a secure funding source from beginning to end. More importantly for him, however, Senator Angara’s actions over the next two weeks will answer an important question that many Filipinos have been asking: is Alagang Angara a genuine brand of public service? We do hope it is not a mere buzzword to aid his upcoming electoral campaign. Carlos Jacinto is a researcher of Action for Economic Reforms’ health financing team. ← Will Senator Angara play Big Tobacco’s game?